In the post Second World War era both the Indian motorcycle company of the United States and Vincent HRD in Britain were struggling financially. Indian were struggling because of a series of poor management decisions in their history especially with regard to their having starved their dealerships of motorcycles during the US involvement in the First World War which caused many to migrate into the Harley-Davidson camp, and in changes they had made to their popular Indian Scout, changes that were not popular with customers. By the end of World War II Indian were a company starved for much needed research and development cash, and they were a company looking for direction. Two Indian/Vincent prototypes were constructed; one with a Vincent engine in a modified Indian frame, the other a Vincent Rapide modified to American specification and using some Indian parts and electrics. This is the second prototype. On the other side of the North Atlantic the Vincent HRD motorcycle company had no difficulty in coming up with designs and production motorcycles that were, without exaggeration, the most advanced in the world. Britain was in the throes of Austerity and had huge war related debts that would in large part be solved by British industry focusing on export goods to bring much needed cash back into the national coffers. A British gentleman named Mr. Brockhouse had the notion that Indian and Vincent could work together to both their advantage so he initiated discussions between Ralph B. Rogers of Indian and Phil Vincent of Vincent HRD. Ralph B. Rogers was well aware that the big weakness of his current Indian Chief was its by then quite antiquated engine. If Indian were to prosper and even survive against the competition with Harley-Davidson then the Indian Chief needed a new modern engine and Indian did not have the resources to create one. Ralph Rogers understood that he needed a traditional American style Indian Chief to appeal to his US market. Phil Vincent’s thinking was a bit different. Phil Vincent was a performance motorcycle enthusiast and expert. His idea was to create the best performing, best handling motorcycle possible and market that in both the United States and the rest of the world. Two men, and two different visions, two prototypes would be needed to evaluate what was going to be the best way forward. 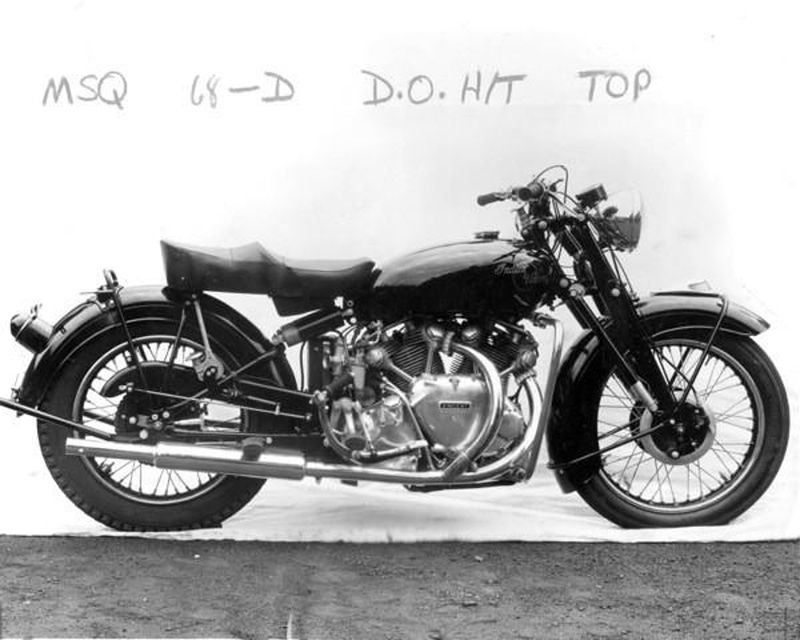 Two prototype Indian/Vincent hybrids were built. The first was an Indian Chief with a 998cc Vincent Rapide V twin engine shoehorned in. In this picture we see Phil Vincent in the saddle. (PIcture courtesy ensanian.com). 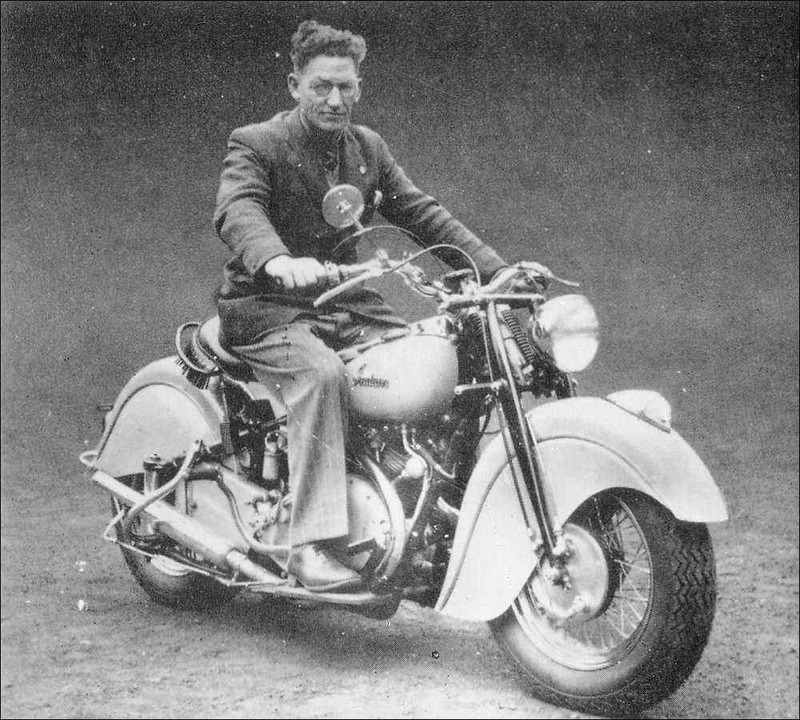 In 1948 Ralph Rogers shipped a complete Indian Chief over to Vincent HRD’s Stevenage factory. Phil Vincent and his team started by road testing the 580lb Indian Chief and discovered it could make 88mph in a short burst but could only sustain 80mph. The Brits decided that the American bike needed to go on a bit of a weight loss program as well as getting a better engine into the boiler room so they proceeded to remove the Indian engine and other bits and pieces to try to trim it down. The end result did not result in a vastly lighter bike, but with the Vincent Rapide engine ensconced in the modded frame the top speed went up to 114mph so the project was without doubt a success. This is the second prototype which was a Vincent Rapide modified for the US market and using Indian components where possible. 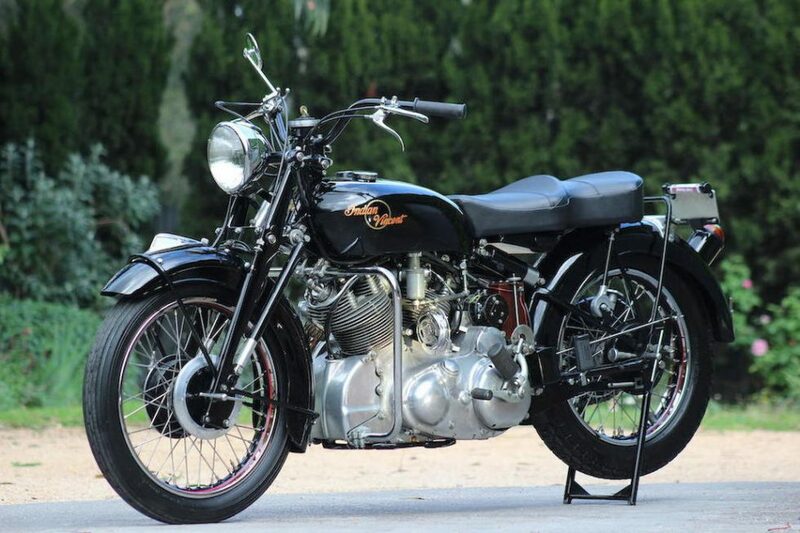 The second prototype was essentially a Vincent Rapide but it was modified for the US market and used some Indian parts and electrics, it was an example of what Indian could manufacture in the United States. 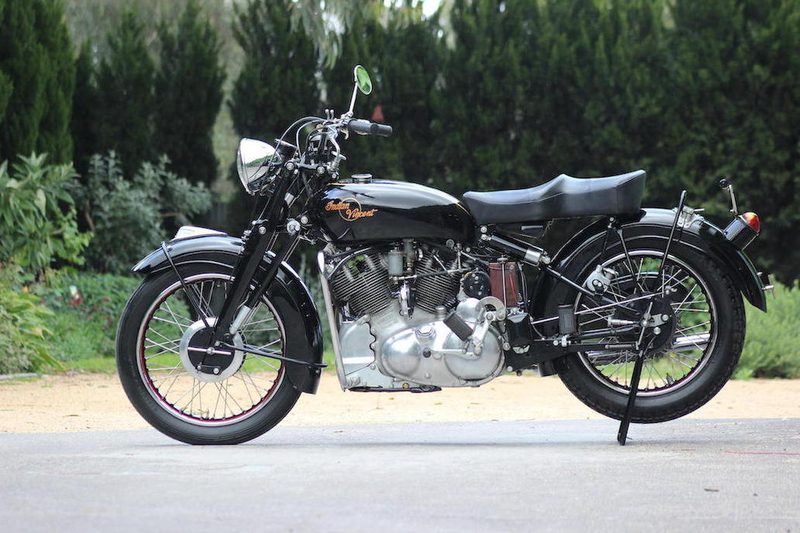 The Vincent Rapide V twin engine in that much more British style bike was a good handling and quick sports bike. The bike combined the Rapide’s performance with American electrics with a foot operated gear shift. It was a vision for America’s future and indeed Phil Vincent’s vision would be proven right for in the coming fifties the British bikes from the likes of Triumph, BSA, Royal Enfield and Norton would take the American motorcycle market by storm. Indian would even try badge engineering British bikes such as by Royal Enfield and selling them to survive. The second prototype, an Americanized Vincent Rapide. The second prototype was without doubt the better handling and performing bike. 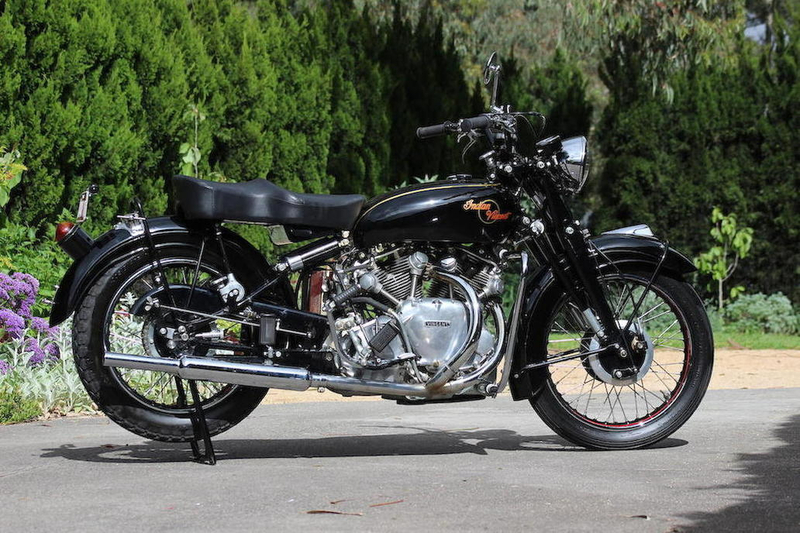 It was a big V twin with high touring handlebars and it foreshadowed the coming not only of the British imports of the fifties but also the later Honda CB750 of the sixties. Ultimately the prototype bike would be taken by Phil Vincent to Australia where it would remain for much of its life. The complete second prototype that was built by Vincent HRD in 1949. 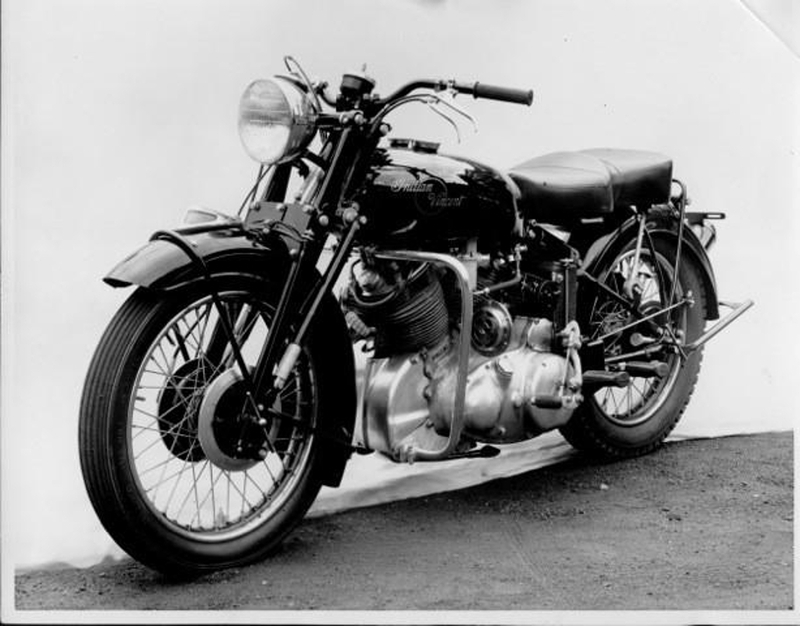 The first prototype bike was taken apart and shipped back to Indian in the United States. The second prototype survived complete however and is to be offered for sale by Bonhams at their Las Vegas Motorcycle auction to be held at the Rio Hotel and Casino on 26th January 2017. So this is an opportunity to acquire this unique and historic motorcycle. This Indian-Vincent could have been exactly what was needed to replace the Indian Scout, a light, quick handling, quick motorcycle. 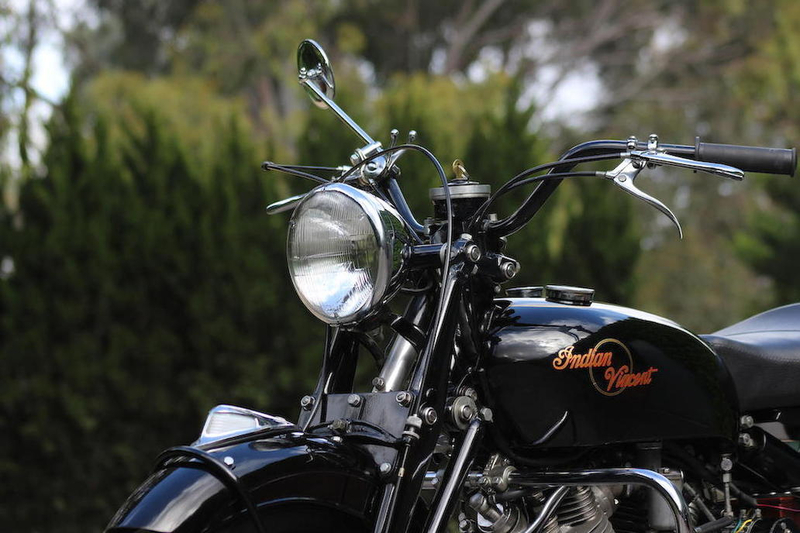 Sadly neither the “Vindian” Chief nor the Indian-Vincent were put into production. Indian ceased in 1953 and the company was purchased by Brockhouse Engineering. Mr. Brockhouse attempted to continue the company using imported badge engineered British bikes but to no avail.